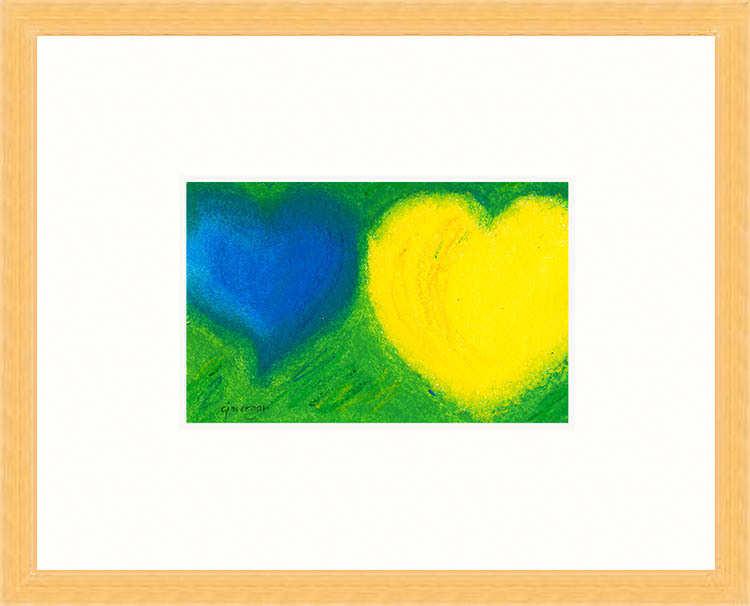 Framed heart painting © 2009 Catherine Jo Morgan, "I Will Give You Everything" - oil pastel on Arches 300-lb. watercolor paper, signed cjmorgan. Image 4" X 6" - framed 8" x 10"
"I Will Give You Everything!" I encountered the hostess in the hallway just as she was getting a phone call. This was before cordless phones, and she looked at me, worried. "Can you give me a pencil?" I blurted out, "I'd give you anything!" We gazed at each other for a few seconds, startled. Until that moment I'd had no idea that I was falling in love, and with a woman, no less. Huh! Well, the end of the story is that we were together for over 44 years, till her death three years ago -- and in many ways, still together now. In her last year of life I realized that when you feel you want to be with someone for eternity, not just "till death do us part" -- then hey, you've got a solid relationship! Whatever this painting might mean to you -- I guess you can see that it has something to do with love! The materials and framing are all archival -- Sennelier professional oil pastels, Arches 300-lb. watercolor paper, archival reversible hinging of the painting in a Bainbridge Artcare mat. The painting is protected with glass (thus easy to clean) and wired for hanging.